Squamous papilloma is a rare benign neoplasm seen in the bladder. It is composed of papillary cores with overlying histologically benign squamous epithelium. 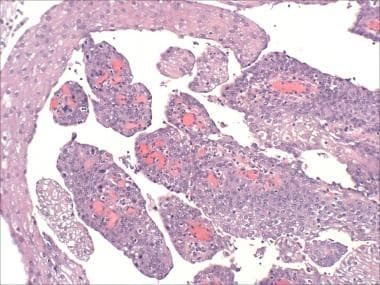 [1, 2] It is unclear whether squamous papilloma represents the squamous counterpart of urothelial papilloma. Squamous papilloma of the bladder is composed of a delicate fibrovascular core covered by benign squamous epithelium. Cheng L, Leibovich BC, Cheville JC, et al. Squamous papilloma of the urinary tract is unrelated to condyloma acuminata. Cancer. 2000 Apr 1. 88(7):1679-86. [Medline]. Lopez-Beltran A, Requena MJ, Alvarez-Kindelan J, Quintero A, Blanca A, Montironi R. Squamous differentiation in primary urothelial carcinoma of the urinary tract as seen by MAC387 immunohistochemistry. J Clin Pathol. 2007 Mar. 60(3):332-5. [Medline]. Guo CC, Fine SW, Epstein JI. Noninvasive squamous lesions in the urinary bladder: a clinicopathologic analysis of 29 cases. Am J Surg Pathol. 2006 Jul. 30(7):883-91. [Medline]. Cheng L, Darson M, Cheville JC, et al. Urothelial papilloma of the bladder. Clinical and biologic implications. Cancer. 1999 Nov 15. 86(10):2098-101. [Medline]. Lopez-Beltran A. Bladder cancer: clinical and pathological profile. Scand J Urol Nephrol Suppl. 2008 Sep. 95-109. [Medline]. Lopez-Beltran A, Montironi R. Non-invasive urothelial neoplasms: according to the most recent WHO classification. Eur Urol. 2004 Aug. 46(2):170-6. [Medline]. What Does It Mean for a Recommendation to Be Evidence-Based? What Do You Think of Home Genetic Testing?